Rinse the lentils well in a sieve and tip into a medium-sized pan. Add the stock and bring to the boil. Reduce the heat, cover and simmer, stirring occasionally, for about 15 minutes until the lentils are soft and all the stock has been absorbed. Preheat the oven to 200 degrees C/Gas Mark 5 and line the bottom of a small casserole dish with greaseproof paper. Warm the oil in a frying pan and add the onion, leek, red pepper, mushrooms and garlic. Cook for 5-10 minutes until soft, then stir in the lemon juice. Put the lentils and veggies into a mixing bowl. Add the breadcrumbs, cashew nuts, cheese and egg and mix well. Transfer to the casserole dish. Smooth out the top and cover with a piece of lightly oiled aluminium foil. Cook in the oven for about 30 minutes, then remove the foil. Cook for a further 25/30 minutes. Check by inserting a skewer into the middle – when it comes out clean, the loaf is ready. Remove from oven and leave to cool and set in the casserole dish for about 10 minutes. It will now be easy to turn out of the dish and cut into slices. 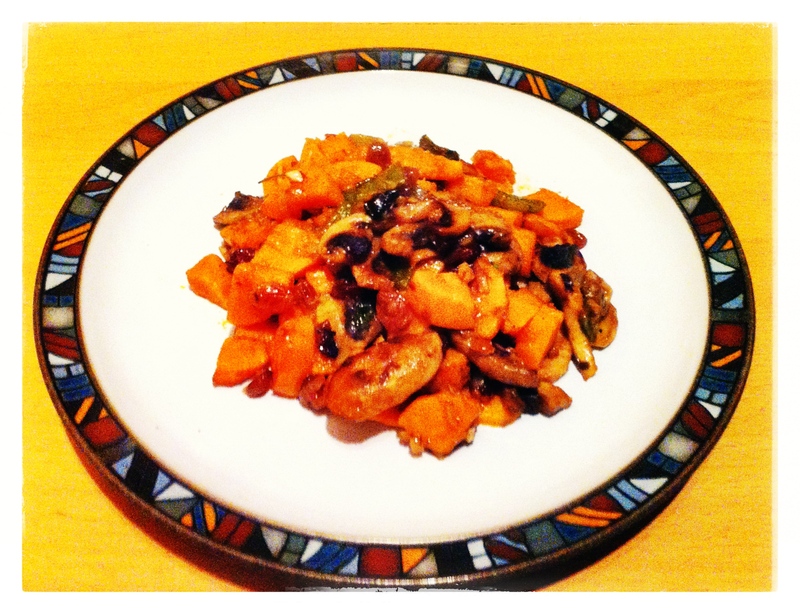 The photo does this dish no credit whatsoever…it tastes much better than it looks! For a deeper-looking “roast” (which will easily serve 4 people) double the recipe so that it fills the casserole/loaf tin properly and will give you nice, thick slices. Heat 1 tbsp of olive oil in a deep pan and fry the onions, courgette and garlic over a medium heat for 5-10 minutes, stirring occasionally until soft, then transfer to a dish. Pour the remaining 1 tbsp of olive oil to the pan, then sauté the aubergine and peppers for about 5 minutes, stirring occasionally. Add the tomatoes and chuck the onions, courgette and garlic back into the pan. Stir well, then cover and simmer for a further 10 minutes, stirring now and again. In the last minute, add the lemon juice, salt and pepper, and stir well. 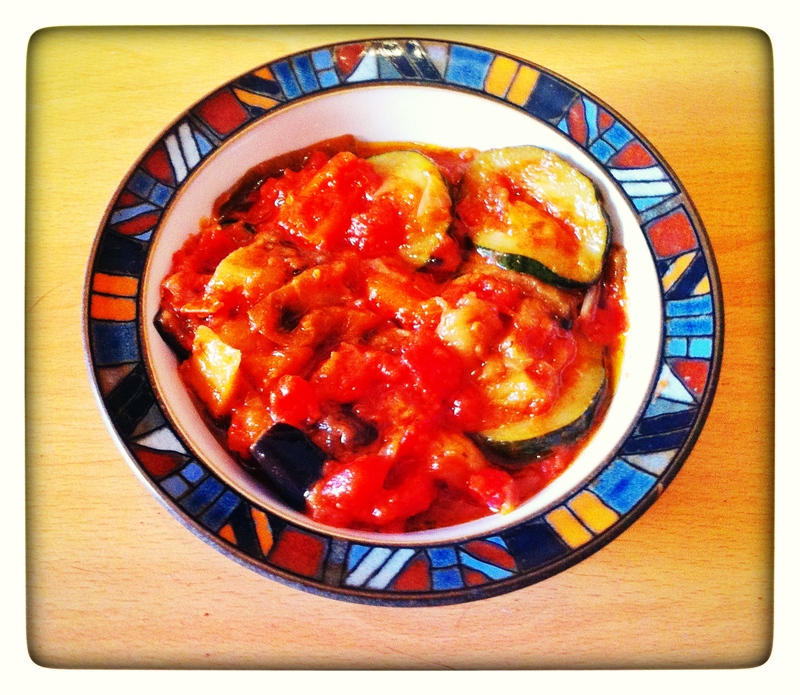 This ratatouille is ideal for freezing but if so, don’t add the lemon juice until you thaw it out to re-heat it. 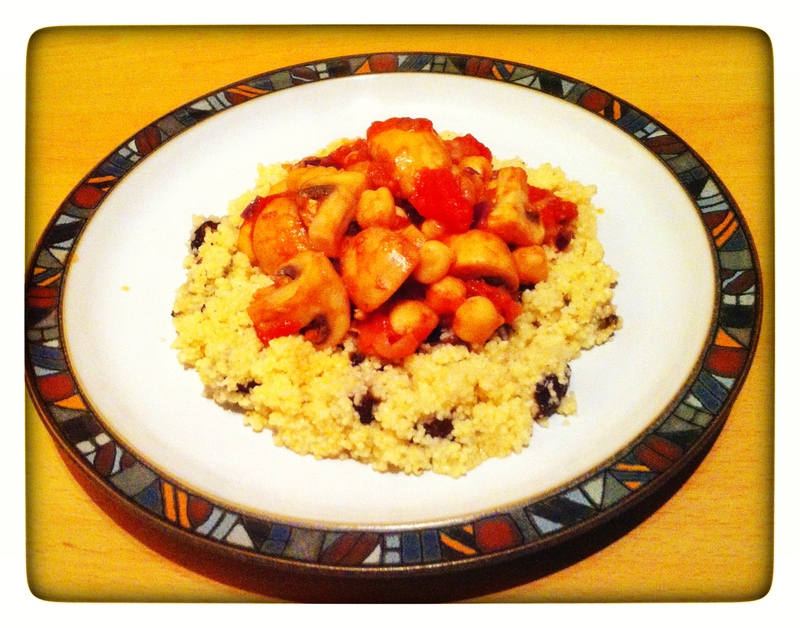 Morrocan Mushrooms & Couscous…for one!! Fry the onion and garlic in the olive oil for about 5 minutes, or until they soften. Add the cinnamon and cumin, stir well then add the mushrooms. Cook for another couple of minutes before adding the tomatoes, chickpeas and honey. Simmer over a low heat for about 10 minutes, stirring occasionally. Mix the couscous and prunes together in a dish, then pour over 120ml boiling water. Cover the dish and leave to stand for about 8 minutes. Fluff up with a fork and transfer to a plate. If you are not a fan of prunes, this would also work well with dried apricots. 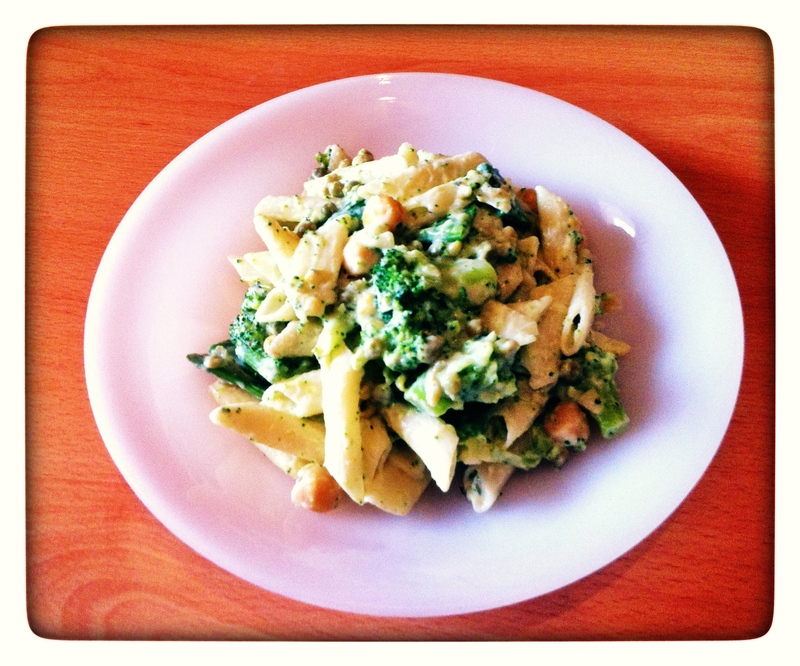 Pasta with Chickpeas and Creamy Greens…for One! Par-boil the broccoli and green beans for about 10 minutes until they start to soften. Drain and set aside. Cook the pasta in a large pan as per the packet’s instructions. Three minutes before the end of cooking time, chuck in the broccoli, green beans, peas and chickpeas. Scoop out a ladle-full of the cooking water and put into a mug or dish, then drain the contents of the pan into a colander. Tip everything back into the pan and stir in the mascarpone or soft cheese, lemon juice, grated cheese and ladle-full of cooking water. Season with black pepper and stir well. Heat through….and Bob’s your uncle!!! Delicious on its own, or serve for two with an accompaniment of crusty bread or side salad. 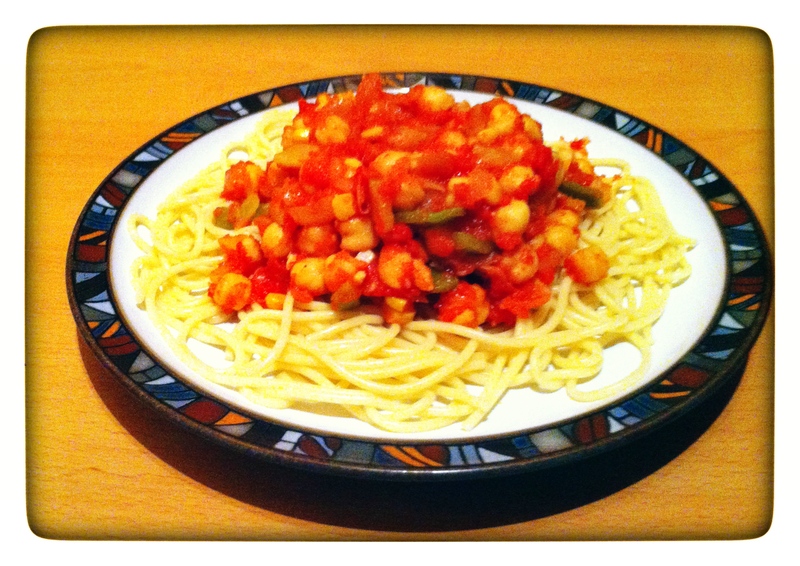 Spaghetti with chickpeas and spicy tomato sauce for One! Cook the spaghetti in a large pan of boiling water according to the packet instructions. Meanwhile, heat the olive oil in a large frying pan and add the onion, garlic, green pepper and celery. Cook over a moderate heat for about 5 minutes or until soft. Stir in the chopped tomatoes, with their juice, and bring to the boil. Reduce the heat and simmer gently for about 15 minutes, stirring occasionally, until the sauce thickens. Add the chickpeas, sweetcorn, cayenne pepper and salt and pepper and simmer, whilst stirring, for another couple of minutes. Drain the spaghetti and mix in with the sauce, or simply transfer straight to plate and add the sauce to the top. This recipe would also work well with fettuccine or tagliatelle. 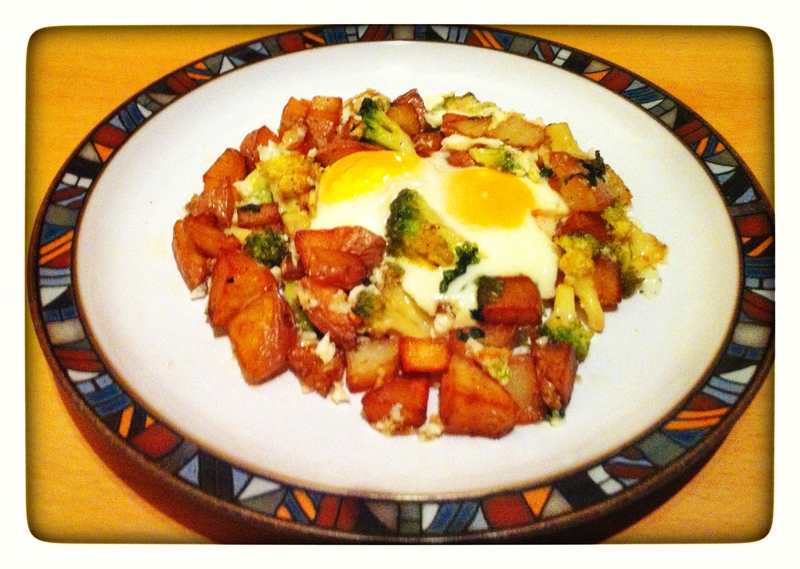 Baked eggs with broccoli and potatoes for One! It might sound like a strange combination but trust me. It works!! Par-boil the broccoli florets for about 10 minutes or until they just start to soften. Heat the oil in a large frying pan. About 5 tablespoons should do it…you need enough to give the potatoes a good covering as you fry them. Stir them over a medium heat for about 10 minutes, then mix in the broccoli. Cook for a further 5 minutes or until the potatoes are tender and golden. Next add the parsley, garlic, salt and pepper, then remove from the heat. Transfer everything into an ovenproof dish. Make a hole in the middle and break the 2 eggs into it. Pop into the oven and cook at 200C/Gas Mark 6 for about 10 minutes. The whites of the eggs should be cooked through by this time but the yokes still nice and runny. 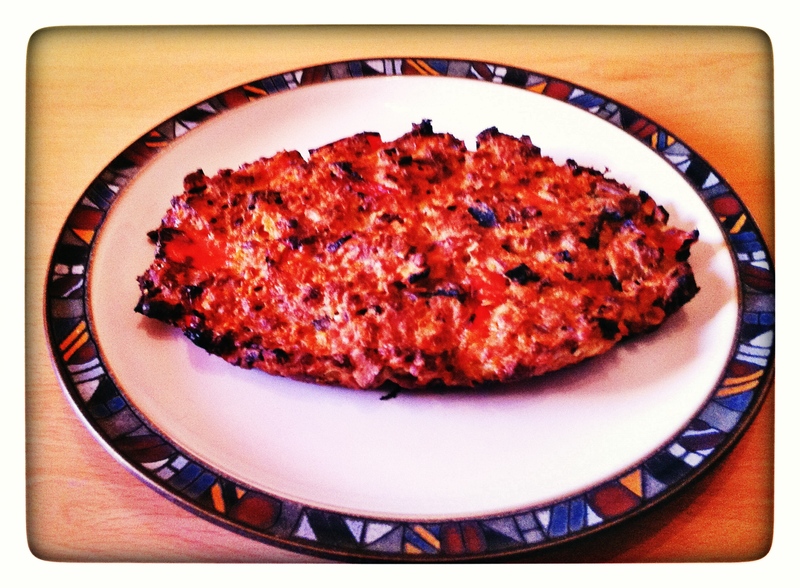 For that extra bit of decadence, add grated cheese to the top of the dish and stick it under the grill for 5 minutes. Mature Cheddar or Goat Cheese would work wonders. This realisation dawned on me about half-way through cooking but, alas, my fridge was completely cheese-less at the time. Gutted! Vegetable and Red Bean Pasta for One! Pour the vegetable stock into a large saucepan and bring to the boil. Reduce heat and add spinach, broccoli, onion, garlic, cayenne pepper, salt and pepper. Stir in the beans and cook for about 10 minutes, stirring regularly. Add the tomatoes and cook for a further 15 minutes or until the veggies are all tender. Stir in a couple of teaspoons of pesto sauce and mix well. Add the pasta to the saucepan and mix everything together, or serve the veggies on top of the cooked pasta. 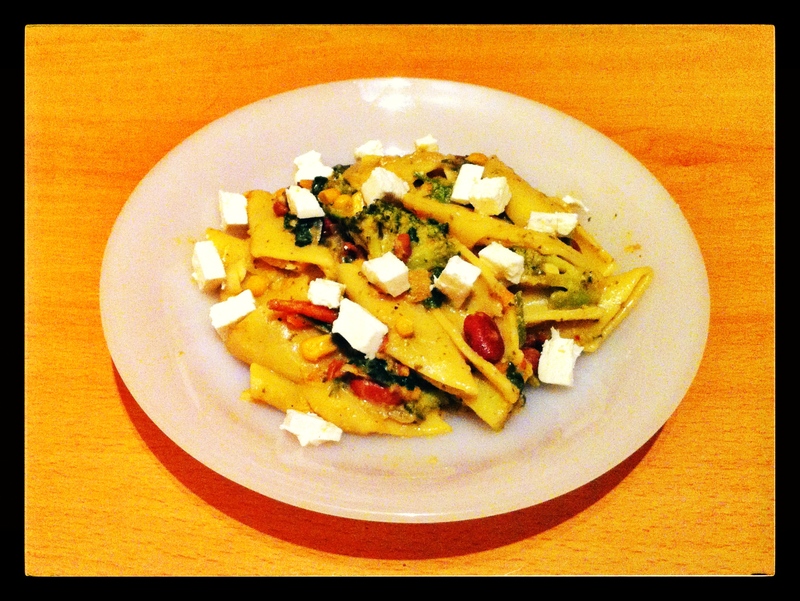 If the mood so takes you, add some grated, crumbled or cubed Feta cheese…just for the sheer heck of it! I used Rigatoni when I made this, but I think it would probably work even better with smaller pasta pieces like Penne, Fusilli or those funky little bow-shaped ones. Whilst most of my recipes are for single servings, this one will easily serve two people, possibly even three if it is an accompaniment. Boil the sweet potatoes for about 10 minutes, or until they are soft, but still holding their shape. Drain the water and arrange the potatoes in an ovenproof casserole dish. Fry the onion, garlic, green pepper and mushrooms in the olive oil, stirring constantly for about 5 minutes or until they start to soften. Add the raisins, sauce, parsley, salt and pepper and stir well. Bake at 180 degrees C, gas mark 4 for about 25 minutes until piping hot and golden brown. You can use whatever sauce you like with this dish. The chilli picante sauce gave it a nice spicy kick, but brava, romero or barbecue sauce would work well too. Stir in the onion and garlic and cook for about 5 minutes until the onion is translucent. 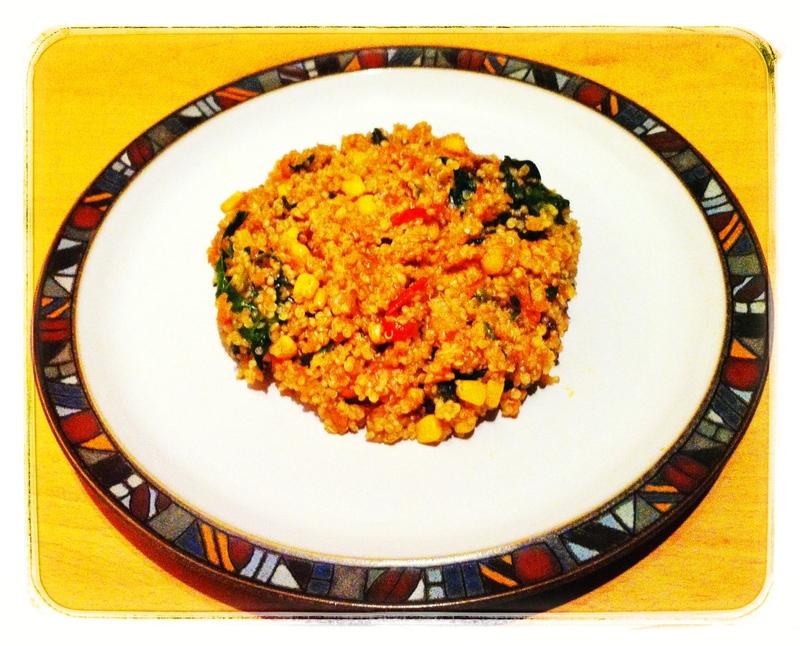 Turn down the heat to low and stir in the quinoa. Toast it for just a minute or two. Next add the stock, black pepper and oregano and bring to the boil. Cover, reduce the heat back to low and simmer for about 5 minutes. Stir in the carrots. Cover again and simmer for about 10/15 minutes, or until all the water is absorbed. Remove from the heat, add the tomato, spinach, sweetcorn and sultanas. Stir for about 2 minutes until the spinach is nicely wilted. This will give you one very generous serving as a main dish, or two if it is accompanied with salad, bread etc. This recipe is adapted from a typical Andalucian tapas dish “Patatas a la Pobre” or Poor Man’s Potatoes. Unlike my other recipes which are for single servings, this one will easily serve two people, possibly even three. Peel the potatoes and cut them into slices about half a centimetre thick. De-seed the pepper and cut into strips. Put all this into a mixing bowl, add a splash of olive oil, salt, pepper and Cayenne Pepper. Mix thoroughly and transfer to an oven-proof dish. Pour in the stock and drizzle more olive oil on the top. Cook for about 35/40 minutes, until the top is nice and brown and crispy. Oven should be 200 degrees C in a fan oven, 220 degrees C in an electric oven, or gas mark 7. 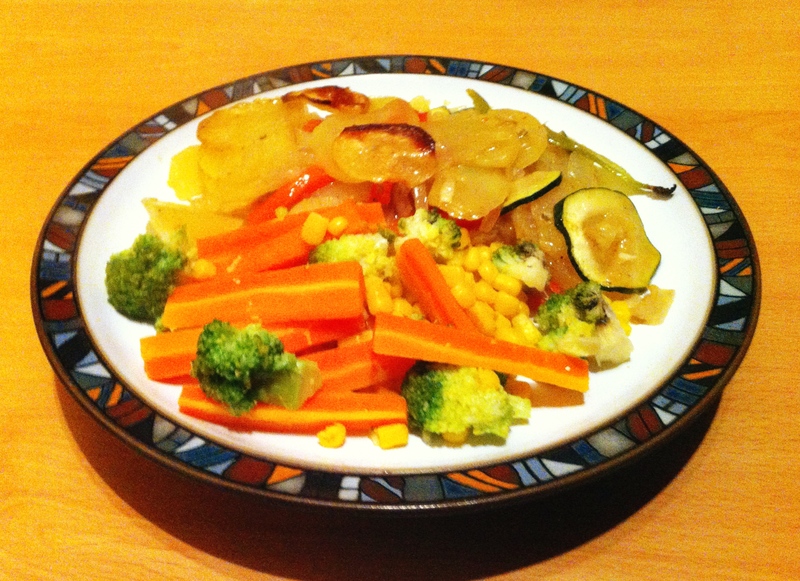 Make it more colourful by using a mixture of red, green and yellow peppers. You can use any herbs or spices you fancy in this recipe. I’m just a big fan of Cayenne Pepper…as you’ve probably gathered by now!